$360K a year provost sweetens offer to $14K a year grad students – or does she? This just in. Has $360K a year (plus $775 a month for her car) Acting Provost Frances Bronet decided to ignore the advice of her $300 an hour HLGR lawyers Jeff Matthews and Sharon Rudnick (and Randy Geller and Dave Frohnmayer?) and sweeten the GTFF deal? I’d like to update you on the latest status of negotiations with the Graduate Teaching Fellows Federation. 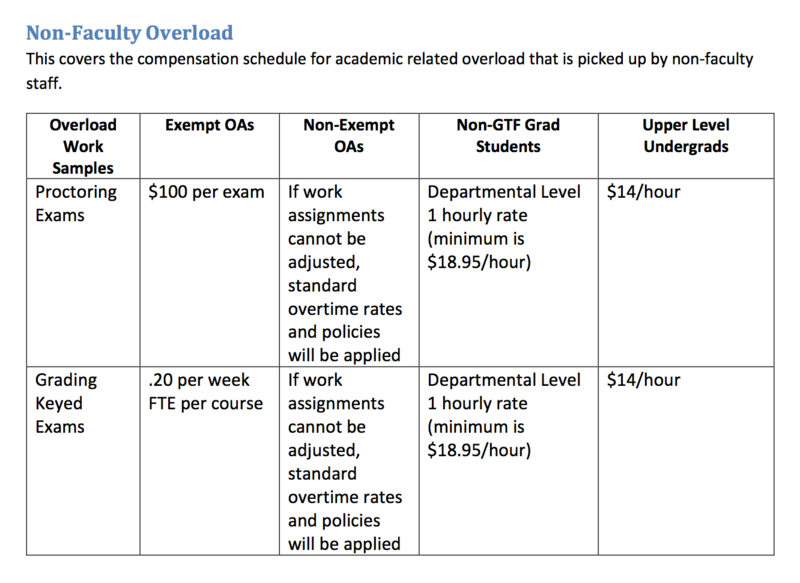 The University of Oregon has announced that it has expanded an already robust offer to include guaranteed flex time, officially recognized in the contract. Under this new contract provision, it is guaranteed that all GTFs who need to take up to two weeks off due to a family or major medical situation will be able to flex their hours in order to do so. They also will have the ability to work with their departments and the Graduate School to explore whether more extensive schedule changes can be accommodated over the life of their contract. During the period that GTFs are exercising flex time, they will still receive full salaries, tuition and fee waivers, and health insurance coverage for their entire family. Full family health, vision, and dental coverage with the university paying 95 percent of the premium. This is by far the best healthcare package for graduate student teachers in Oregon and across comparable AAU institutions. We respect the right of GTFs to conduct a legal strike and hope to reach a fair and equitable agreement quickly. For complete details of the current offer, please visit http://provost.uoregon.edu/gtff-negotiation. This is a critical time for the University of Oregon. We recognize that there are thousands of undergraduate students who are looking to the university to finalize grades so they can graduate, secure financial aid, or solidify their registration for winter term. As this offer demonstrates, we do not want our ongoing negotiations to negatively impact anyone, especially our students. We are working on contingency plans designed to ensure that there is as little negative impact as possible. The [Senate legislation, here, top of new business for Wed the 19th] claims that these measures would weaken academic standards that the faculty have a duty to uphold. It asks that the administration work “openly, publicly and transparently with the UO faculty” in finding a solution that would keep academic standards. Once again the UO administration is trying to subvert the faculty’s role in academic governance with secret meetings and hidden documents. Once again, the only way to get them to discuss these matters with the faculty is to get leaked documents, or spend hundreds of dollars and wait weeks for Dave Hubin’s office to sell heavily redacted public records, and then go to the Senate with legislation. (And many thanks to the anonymous leaker, who sped this process up considerably. Please keep them coming). 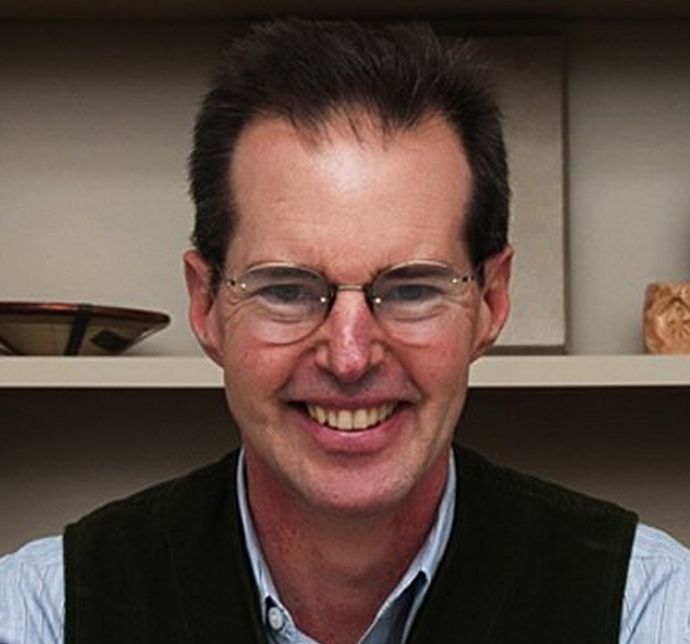 Perhaps unsurprisingly, VPAA Doug Blandy is well known for weakening his own department’s academic standards with the Arts and Administration 250-252 “twofer” courses that have brought in millions in student credit hour cash, saved the GPA of many a marginal UO student, and launched Blandy into an administrative career that has boosted his own pay from $78K to $180K. A typical grade distribution? Johnson Hall has gone to the mattresses, into the bunker, and off the deep end. The Senate will presumably repudiate this latest nonsense on Wednesday, along with the administration’s previous “confidential” strike plan, and their efforts to scare off our international grad students. Email and docs below. 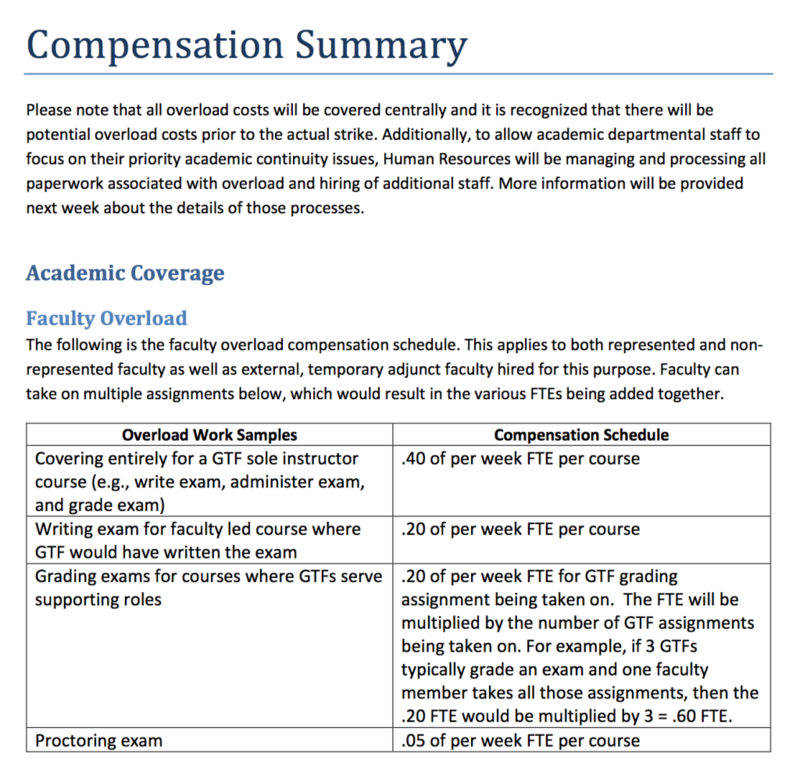 In a nutshell, they propose to pay the faculty 0.4 FTE per week per course to cover courses being taught by striking grad students. I’m no economist, but the average UO tenure-track professor gets paid about $2500 a week (for the 9 months they get paid), and 0.4 of that is $1000. UO pays the GTFs about $400 a week. The extra $600, multiplied by many hundreds of courses, has to come from somewhere. Is the administration going to add it to the next undergraduate tuition increase, or are they going to subtract it from next year’s faculty merit raise pool? Yes, I know that knuckling under to the GTFF’s outrageous demands for 5% raises and 2 weeks of sick pay (comparators UNC and UCSB give 6) will cost money too. But it will also help UO get more and better grad students (and UO grad enrollment is down 10% over the past 10 years). In contrast this silly strike plan is just deadweight loss. Unless you’re a $300 an hour HLGR lawyer. The university remains committed to the collective bargaining process with the Graduate Teaching Fellows Federation. While we have yet to reach an agreement, we remain hopeful that we can do so and that a work stoppage will be avoided. At the same time, the university would be remiss if it did not prepare for the possibility of a work stoppage. If you are interested, the university’s current proposal is available here<http://provost.uoregon.edu/gtff-negotiation>. The purpose of this memo, however, is not to discuss negotiations, offers, or mediation. It is about finding ways to meet the needs of our thousands of undergraduate students and causing as little disruption as possible to their academic experience. The coping strategies, attached, are meant to ensure that all students receive a final grade so as not to jeopardize their fall term graduation, winter term registration, or financial aid. We appreciate your understanding during this challenging time and ask that you share this planning guide with your office/budget managers and faculty who will be assisting in academic continuity plans. Tagged Barbara Altmann, Doug Blandy, Frances Bronet, GTFs. Bookmark the permalink. 31 Responses to $360K a year provost sweetens offer to $14K a year grad students – or does she? Why does the admin page show benefits for comparators but not pay? After God had finished the rattlesnake, the toad, and the vampire, He had some awful substance left with which He made a scab. A scab is a two-legged animal with a corkscrew soul, a water brain, a combination backbone of jelly and glue. Where others have hearts, he carries a tumor of rotten principles. When a scab comes down the street, men turn their backs and Angels weep in Heaven, and the Devil shuts the gates of hell to keep him out. No man (or woman) has a right to scab so long as there is a pool of water to drown his carcass in, or a rope long enough to hang his body with. Judas was a gentleman compared with a scab. For betraying his Master, he had character enough to hang himself. A scab has not. Esau sold his birthright for a mess of pottage. Judas sold his Savior for thirty pieces of silver. Benedict Arnold sold his country for a promise of a commission in the British Army. The scab sells his birthright, country, his wife, his children and his fellowmen for an unfulfilled promise from his employer. Esau was a traitor to himself; Judas was a traitor to his God; Benedict Arnold was a traitor to his country; a SCAB is a traitor to his God, his country, his family and his class. I’m wondering how the “Academic Continuity Team” came up with these numbers. Did they conduct a survey? Q. How much would you need to be paid to sell out your graduate students? A The normal operations of the class shouldn’t occur during a strike, and undergraduates won’t get their grades for the term. B Lame mimics of real coursework will take the place of written exams, lab work, etc., so that everything can be graded by scantron etc. C Faculty and others volunteer to work in courses so that normal things get done, and work for free. D Faculty and others volunteer to work in courses so that normal things get done, and are paid. B is terrible, and the message it will send to the administration is that watered down non-labor-intensive assessment is fine. C is also terrible, since it sends to the administration the message that GTF strikes are painless for them to deal with. A makes undergrads and their parents mad, which is probably best for leading to real change in the administration’s policies, but which causes a lot of pain. D also forces the administration to realize that a GTF strike has real, and big, costs, but it makes the faculty scabs. C and D aren’t really possible in many cases. Most faculty already have full loads and can’t manufacture more hours. Those options also feed into the administration’s claims that the burden for all the negative consequences falls on faculty and the GTF’s. It is up to us to make sure our undergraduate students get the education they deserve. In none of their communications have they asserted that about themselves. You forgot E – hire scabs from the community. Because of course that can be done in a matter of days and they will be able to step on campus and perform the work of GTF’s with little chaos or loss of quality. Whatever “side” you are on, one thing is clear. The bumbling responses from JH continue as they always have. The “Academic Continuity Team” will provide neither of those things. Bravo to the dashing duo of Blandy and Altmann for coming up with their brilliant plan to the upcoming strike, right down to weekly scab pay rates. Think again Blandmann. We faculty can support the striking GTFs by issuing “X”s for final grades instead of Y or I. An X grade, which means grade not reported by instructor, will not negatively impact transcripts or financial aid status. Once the strike is over, Xs can be replaced by conventional letter grades. 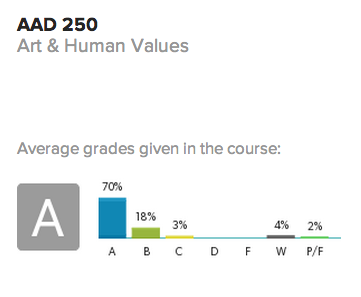 X grades also work for courses where GTFs play a role in teaching and/or grading. 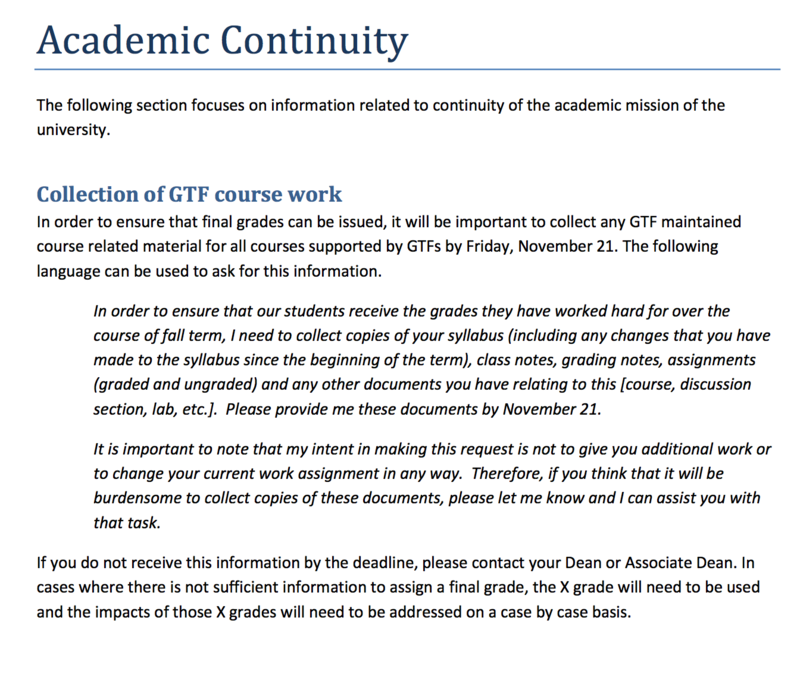 After the strike is resolved, the GTFs have promised to return to finish work not completed during the strike and final letter grades will be issued. Our undergrads are strongly supportive of the GTF action and will understand the issuance of Xs if explained to them in advance. The administration has the funds to pay for the reasonable demands of the GTFs and avoid the strike, however they are choosing to let the strike go forward because they are afraid other part-time employees with 0.49 or less FTE appointments such as part-time NTTFs will ask for the same. The administration’s sensitivity, colleagiality and respect for our fellow colleagues are underwhelming. Such insensitivity will also not help the current efforts to increase grad student numbers to remain in the AAU. What is perhaps most galling is that the administration has yet again trotted out the lack of funds excuse while simultaneously raising their own salaries. The GTFF, faculty union and student leaderships have all endorsed the proposal to issue X grades in case of a strike. We faculty cannot do our work nor provide a decent educational experience to our undergrads without our GTFs. We must support their fight for a livable pay and reasonable benefits. I am open to a better suggestion that will allow us faculty to support the GTF strike without harming our undergrads but at the moment the X grade idea seems the best approach. Ya think there are any public records out there of these “dozens of conversations” that “informed” the strike plan? It would seem the pinheads in Johnson Hall are pushing their luck. How far and for how long will students, grad and undergrad, tolerate inequities between athletics and academics, between athletes and ordinary students, between admin bloat and tuition hikes? And for heaven’s sake, why don’t more students choose to take to the street to support their mentors? It gives this alum great pride to see that some UO professors are willing to side with the GTFs and poke the administrators in the eye! Grading is pretty easy when you give everybody an A. Maybe the administration plans to pay for the strike by diluting and degrading *administrative* standards? Ending the expensive public search process and just hiring their friends, for example. That would save lots of money. If what Blandy says is true then it should be easy enough for him to provide a detailed accounting of these conversations at the upcoming Senste meeting. Who they met with and who supported this plan. Maybe we should find an English professor, or at least an English grad student who is not preparing to strike, to help Mr. Blandy with his writing. What a bunch of ungrammatical mush. Let’s just give him an “X” and move on. Why an X? This work deserves a grade. D? One more thing. Blandy misses the point. It matters not whether he talked with deans/department heads. We have a system of shared governance on academic matters the administration ignores or sidesteps when convenient (think Cluster Hires). Ad hoc conversations with select people who will agree with administration is not shared governance. We have a Senate, Undergraduate and Graduate Councils who possess sole responsibility over academic matters. These bodies were not consulted. This is the reason for the Senate motion denouncing these practices. It’s heartening to see faculty with the b*lls to call out the corrupt combination of yes-manship and bullying that is increasingly the modus operandi of this institution. Deans, Associate Deans and Department heads are not the elected representatives of the faculty with regard to academic matters. In most cases, they are selected by administrators. Blandy does not understand how shared governance is supposed to work or he does and is ignoring it. Yes, although departments usually have an election of a head, the Dean made it quite clear that this vote was for informational purposes only. I hope the GTFF is telling GTFs to ignore any requests from department heads to turn over course-related materials by November 21. I’m pretty sure that’s not a duty specified in any GDRS. So, as it turns out, since course materials developed by GTFs for UO courses are UO intellectual property, GTFs are required to comply with reasonable requests to provide them to the administration (this would be true regardless of whether a strike was happening.) GTFF leadership has been clear on this in communication to members. How GTFs comply is a grey area – its certainly possible to do this in a way that is maximally annoying to the scabs paid 2x our pay rate to do our job 3x worse. Shuffling notes in random order, sending uncompiled .tex files, etc. I for one urge our GTF’s not to sink to the level of UO’s Public Records Office, by using delays or obsolete, degraded file formats to attempt to frustrate and delay information requests. Fair enough. I agree that the fact that the university has zero respect for transparency and compliance with reasonable requests is not a justification for the GTFF to behave in the same reprehensible way. But maybe since the reason for the request is transparently part of a dispute between the GTFF and the university, GTFs should tell their department heads to “go through channels” instead of dealing with individual GTFs directly. I can tell you that a department head responded to my own requests for very-easily-provided public information this way specifically to harass and obstruct me during a grievance process through the GTFF. What comes around should go around. Surveys show that’s the main reason people join unions. Bob Berdahl and Mike Gottfredson brought many skeptical UO faculty into the union movement. And now Scott Coltrane is doing the same for UO’s grad students. Is it an established fact that students on financial aid will not be affected adversely if they are given a grade of “X”? I’ve tried to find out from admin but got no clear answer. There are never any negative impacts on our students either academically or with respect to their financial aid status if they receive a grade of “X”. For example, if you forget to turn in grades, students receive an “X” without negative consequences until you submit actual grades. In the current situation, an “X” grade sends a message to the GTFs that we faculty highly value their contributions to UO. It also sends a message to our undergrads that we support quality education. 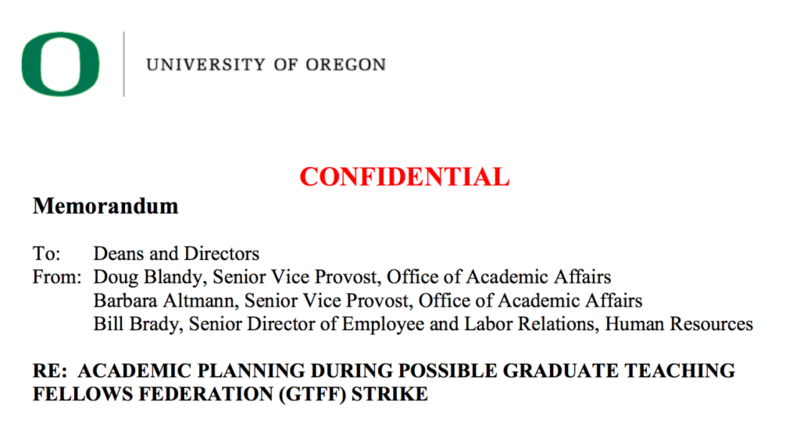 The administration needs to know that we faculty will not be tools in their attempts to demean the GTFs and subvert academic quality here at UO. Do they actually believe that not giving the GTFs a decent wage and sick/family leave benefits will enhance our ability to recruit grad students? Will our instructional quality be improved by GTFs who come to work when they are ill? What moral principle is guiding the administration’s refusal to give the GTFs what they need and deserve? And the administration’s latest suggestion to have non-teaching staff help grade exams and papers illustrates that they do not care about academic standards. This faculty member would be happy to provide such proof of participation. That seems like a reasonable response, and I’d be happy to help any student prove participation. So, why on earth would Johnson Hall want to put the screws on faculty and department heads? What purpose is served by alienating them in this manner? It makes no sense to me. So, paid leave, but without the pay or the leave. And still telling the lie about the health care package, too. From a person whose monthly car allowance is roughly equal to a Music GTF’s monthly stipend. GTFs are salaried employees – we’re already on “flex-time”. The only change this does is allow GTFs to possible push time into other quarters if they need time off. That is, of course, if GTFs are hired for more than 1 term, while many are not. If a GTF only has a contract for 1 term, they can only flex-time in that same term, which GTFs can already do! “Flex-time” is not a serious change to the administration’s proposal – it is just a way to pretend they are making progress. In reality the flex-time offer is what is already in our collective bargaining agreement. The same is true for $61 fees, 95/5 insurance splits, and tuition waivers. ALL of these are in the current CBA. In fact, the GTFF had to fight to preserve the fee limit and insurance split during this bargaining cycle. The administration worked to take these benefits away from the GTFF, and now they are patting themselves on the back for not further damaging the poor financial situation for GTFs.